Steadfast as the trail is; the world outside has turned inside-out since the morning the planes became weapons, and our peaceful country their target. My AT experience served me well that day, as I joined 4700 stranded airline passengers in St John's, Newfoundland, sleeping on the floor of the Convention Center for 6 days stripped of our luggage (a story worth a volume of itself). After release from my exile, I was thrown into the thick of it with unmatched fury. The Airborne Mobility Command needed every plane we can muster, and on watching all our bigger brethren struggling to keep their crippled airlines afloat, we knew our company's very survival depended on this moment. This was the moment for which I joined World though, and I actually enjoyed being thrown to the winds at a host of new and unusual destinations around the globe, a small part of a desperate struggle for our freedom and our homeland. It would be four months since our last hike before we could resume our pilgrimage, and the moment we mounted up our packs; we knew it had been far too long. "An airplane stands for freedom, for joy, for the power to understand, and to demonstrate that understanding. Those things aren't destructable." AT hikers share a love-hate relationship with the Smokies - the most biodiverse region of the entire trail, but also the scene of the most onerous regulations. The sheer numbers of park visitors force a reservations system for the shelters, the use of which is mandatory to preserve the ecosystem. The black bear population also precludes hikers bringing their trusted dogs through, and result in the shelters' odd designs as an inside-out zoo, the open front being caged over to keep Yogi and friends outside. Spring weather for northbounders (the vast majority of thru-hikers) is typically horrid, its cold, wet fury magnified by the 5000'-6000' elevations. To escape the worst of the weather and the crowded shelters, we've planned to take on the Smokies in autumn, but even now several shelters are full, restricting us to erratic daily mileages. The beautiful autumnal color on our drive down ends abuptly at the park, the trees south of here completely stripped of their foliage by a recent windstorm. Still, the weather is perfect otherwise. We get to Wesser at 2:54, starting with the expected continuous climb, though far more gradual. The trail's easy to follow, with distant but good signs and blazes, an excellent grade, and glorious weather. As darkness falls we put on the headlamps, still unsure whether we'll overnight at Sassafras Gap shelter or Cheoah Bald - on finding the former decrepit in appearance, we choose the additional hour up to Cheoah Bald, said to have a spectacular view. Pulling onto the pitch-black bald I hear some odd sounds like snoring (it's only 7:30), and looking around I see a small tent set up on the main overlook here. I shush Coleen as she comes up behind, and after a quick search we find an equally good campsite a few yards further down the trail. Soon the tent's up and we're dining on our sandwiches on a narrow but workable log off to one side in the briars. It's a bit late for a fire, so we decide to head over to the adjacent meadow to lay out and watch the stars with our hot drinks and dessert (the glow of a couple cities just visible over the ridges). There's a deafening stillness out - not a bird singing, not a plane or car, not a breath of wind, and in this eerie but wonderful silence we turn into bed at 10:00. "The absence of alternatives clears the mind marvelously". The sun peeks across the meadow at 07:12 to the same dead calm as last night. It's gorgeous out, and during breakfast and coffee, Youngblood and his partner from the tent come over to chat, up here hiking an intersecting trail to ours (he thru-hiked the AT last year). With the extra miles we did last night, we've an easy couple of days ahead, so we dally a bit before getting away. We pass a handful of southbounders (on target to complete their hikes well before Christmas), and as we walk up and down over the featureless terrain, we hear the roaring of some military planes practicing aerial combat high above, out of sight. Eventually we make the descent to Stecoah Gap, where we stop for a long lunch at the picnic tables, filtering water from a nearby spring. Afterwards, a number of cruel PUDs (pointless ups and downs) afflict us, a particularly steep one out of Sweetwater Gap sapping Coleen's strength badly. After a welcome break at Brown Fork Gap shelter, the PUD's continue to Cody Gap, suggested by Jeff as a good campsite. It looks good, a modestly sized saddle with a level spot for the tent and a nice firepit, though a brisk crosswind blows across. Coleen heads down for water while I erect the tent, though she returns empty-handed, having found only the smallest of mud puddles. Our bottles are almost dry, so the only choice seems to be dropping the tent to hoof it on to Cable Gap shelter - still an hour and a half away. So, we're back afoot, passing a stream but no good tent sites at Yellow Creek Gap, but finally reaching the old but beautiful Cable Gap Shelter - built of huge logs and set in a dense spruce forest. I'm content to sleep in the shelter, but all it takes is a single reference to a mouse in the register to convince Coleen to tent outside. 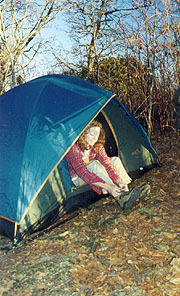 The spring here is meager but flowing, and I set up the tent as she gets water and even starts a fire all on her own. I take over the fire chores as she finishes the cooking, and we eventually head up to the tent at 9:00, our gear hung in the shelter. Like last night, it's a bit warm for sleep, each of us shedding clothes as we rest, and me getting up once to check our gear as some animal wanders about. After breakfast our short day begins with a long climb out of Cable Gap - we won't pass a soul today, but we are rewarded with excellent views of Fontana Lake and its massive dam. After starting down at Walker Gap we stop for a break, but just as we're loading back up, we hear the sound of a C-130 roaring by. As I look overhead for it, Coleen points down towards the dam, seeing the plane swooping low over the lake at no more than 100' altitude. I can't get my camera out fast enough for the picture (would have been stunning), but it's a beautiful sight nonetheless, and the guys in the 130 are obviously having a great time on their "homeland defense" mission. Our steep descent continues, and soon we're at NC 28, where a small group of elderly folks are assembling for their trip home. A bulletin board here has a phone to call the Inn at Fontana Village, but we're already set for Jeff's Hike Inn, with directions to continue another 1.3 miles to the dam, so we do. It's another cruel joke by the architects however, as we abandon the nicely-graded road for the trail, which immediately assaults a number of steep PUD's for no conceivable reason whatsoever. It's a hard mile, and quite a relief to pull into the picnic area near the dam (although the silence is shattered by two old codgers with leaf blowers out maintaining the area). There's not another soul around anywhere, and we go down for a peek at the famed "Fontana Hilton" shelter, which does not disappoint. It's a tidy shelter in a beautiful setting on the lake - spacious, comfortable, and extremely well-maintained, with picnic tables and a fire area on a large pea-gravel bed. The register suggests it's mousy, but it's no matter as we're headed for the Hike Inn anyway. Finally the leaf blowers finish, allowing a peaceful lunch on the picnic table, after which we wander down to the visitor's center and dam, amazed to find no security whatsoever. This surprises us, as Jeff has told us the dam's now secured as a potential terrorist target, closed even to foot traffic for a couple days (which would have greatly complicated our hike). At the moment, it's closed only to vehicles, although they've told Jeff an inspection of our packs would be required to cross - a spectacle which I look forward to photographing in a humorous light (almost certain to get me arrested). Even passing the police station, no one seems interested enough to come out and point us in the correct direction. We finally choose a forest path to the dam, and moments later we're there, finding the facilities locked up tight. We wander around through the various exhibits for some pictures, but soon there's little else save to make the call to Jeff, which we do, getting Nancy on the phone ready to pick us up. We wait a seeming eternity, and eventually one of the leaf-blowers drives by, telling us we shouldn't even be down here, as the road barricade has been moved further back; and that we'll have to head back to the Police Station to sort it all out (he can't give us a ride, as he's got to get to work). Leaving Coleen with the packs I head that way, but before I get far he drives back by, saying that our pickup will be here shortly. Jeff pulls up in a few minutes, having just negotiated his passage with the Federal Marshals at the gate, with arrangements for tomorrow's dropoff as well. Jeff says the roadblocks were just moved to their new location today, and soon we're at the remote and rustic site, where Nancy gives us a key, with offers to do laundry, and a ride out for town food when we'd like. Coleen dives into the shower as I go to work on the primitive tv, having to rewire the rabbit ears to get the one readable channel - NBC. We crank up the heat and I take my shower next, finding soon that Coleen's used almost all the hot water, but getting a passable one in before it dies. We take Jeff up on his offer for town food, finding his helper Larry ready to drive us, along with picking up some chow for he and Nancy. Larry's one of those odd fellows you meet in rural America, with no visible means of support save the occasional shuttle for Jeff, a few days working at his Dad's store, and a government disability (though it looks as though he's never missed a meal). He seems fairly sane, and as we head towards Robbinsville for chow, he suggests Phillips Restaurant, which sports a buffet. The buffet looks more like a collection of biological culture samples though, and we ask for menus, though the step of ordering proves quite an ordeal. The new waitress gets involved listening to a protracted story with a Pentecostal woman and her Indian / New Age-looking partner at the next table, and we're ignored until finally forgotten, dying with hunger all the while. I finally get up and drag her away from the never-ending prattle at the next table, a relief for us all; and soon we're dining on what's actually pretty decent food. Back at the room, we watch the normal NBC fare, having some decaf and turning in at 10:30. 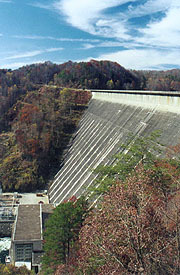 The famous Fontana Dam - doorway to the Smokies! We're up every hour or so in spite of the quiet locale and comfortable beds, and finally get around for good at 6:00, finding Jeff around and Nancy getting so; so after paying up and perusing the Native American artifacts here we head out. The marshals haven't shown up yet, so we bypass the barricades and head to the dam, where Jeff suggests we head across promptly. It's a hazy golden walk across this beautiful structure, and after taking a picture the camera tripod breaks, lightening Coleen's pack a bit, but creating one more chore on our return. The climb up Shuckstack is well-graded but relentless, a climb we'd anticipated with some anxiety our entire AT journey. We start up quietly in hopes of seeing some deer; but they elude us, and soon we turn off the road into the leaf-strewn path once again. Crunching our way uphill the terrain resembles the last few days', though we gradually start to see the biodiversity for which the Smokies are famous. We're glad to be climbing in the cool of the morning, and soon we round the first ridge and get our first view of Shuckstack fire tower. It's an imposing structure, a tall, thin tower erected at the apex of an equally majestic rock promontory, recalling the image of witches' castles from animated horror movies. It'd be a beautiful picture except that I can never find a good enough gap in the trees, so it serves instead as a lighthouse to show us how much climb's left. The path winds around in that general direction, and finally the blue slate cliffs usher us around the back side of the promontory, where the side trail comes suddenly. The tower's very tall and decrepit, a few slats missing on the steps - still, we summon up the courage to head to the top for our snack, with a rewarding view, even if the structure leaves us a little wobbly-kneed. There's a small cab at the top containing a pile of old batteries on which we enjoy our morning snack (most of our previous and future route is visible from here, including Fontana Dam). 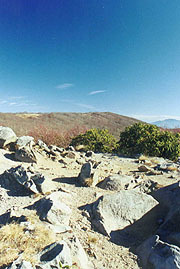 After a long break we resume our trek, following the ridgecrest, now with a far easier trail. A short bit up the trail is the Birch Spring Shelter, a good spot to take advantage of our good pace and short day to drop in and peruse the register. Heading down the path though, we find no sign of a shelter, only a tent platform and a few piles of corrugated roofing. A little research finds the shelter was torn down this spring, leaving behind a pile of mixed messages as to its status. I'm a little irked to have made the trip down to see it, and resolving skepticism towards our old info, we're back to the trail. It's a featureless uphill to Doe Knob for lunch, after which we're appropriately treated to the 1st doe we've seen. 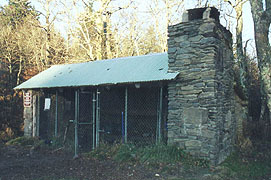 Mollies Ridge gives our first look at a Smokies shelter - stone construction, with a fireplace and the expected grating over the front for bear protection, and set in a beautiful narrow stretch of meadow atop the ridge. It's not long before we reach our destination, the Russell Field shelter - a couple of packs lie here, and as we settle in the guys come up from the spring. They're Mike and Rusty, a couple engineers from Greenwood SC, with Mike showing Rusty the great outdoors. They say the spring's a bit horse-trodden, so I join Coleen, finding that past the first spring crossing are far more palatable accesses further on. As Coleen gets the water, I haul up firewood, and soon we've a fire going in the fireplace, and are ready to start dinner. Mike follows the signs religiously, taking the stove and such outside to cook their meals in spite of the stiff wind blowing across the shelter face. Scofflaws that we are, we choose a more realistic approach - boiling our water inside, though we do take it out into the cold to hydrate and eat. After dinner we retire inside to chat with the guys around the fire, and after our hot drinks and their calls home on the cell phone (their wives are out on a weekend shopping binge), we all turn in at 9:30. "Wish that I was on Ole Rocky Top, down in the Tennessee Hills. Ain't no smoggy smoke on Rocky Top, ain't no telephone bills. " We're up at 6:50 after a mouse-free night, and after retrieving our packs from the bear-hangers outside (looks like a medieval torture apparatus), we have our breakfast and coffee as the guys make their oatmeal. Starting down the easy trail we're amazed at the damage the wild boars have done rooting around it; and we're even treated to the sight of a trio of them trotting along below the trail. Passing Spence Field shelter there's a beautiful field with a view of Rocky Top ahead (made famous by UT football fans), and a bit of frost lingering in the shadows. 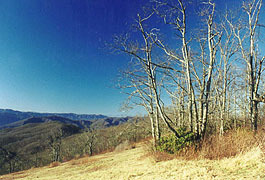 The steep climb up begins in a meadow whose steepness is amplified by the spectacular view, including Fontana Lake. It's a relief to reach the top, soaking in the view with a well-deserved break, though the cold impels us onward quickly. The trail follows a narrow ridge over Thunderhead peak - covered by rhododendron thickly lining the trail, it's a nice change from the earth tones below. Lunch is in Sugar Tree Gap before resuming our ups and downs, with Derrick Knob the most ominous on the profile. We're quickly getting spent on this, our long day; and worse, we're exhausting our water. We have to ration our meager supply to reach Silers Bald, where we find three men working on the shelter site - two older men trying in vain to saw through one log as another young guy is carrying huge logs - almost whole trees - on his shoulder up to the shelter. One of them points us towards the spring - ice cold and incredibly refreshing. After a quick break, our final hour begins, passing a couple hikers who've just come from Double Springs (tonight's destination), saying that no one's there yet, and that they'll return later. We pull in at an early 5:00, with the empty shelter a very welcome rest to our long day. 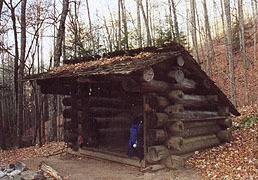 The spring is little more than a puddle, but after consulting the guidebook and looking around a bit, we find a running one on the TN side (after all, it is the Double Springs shelter. Just as we get settled, another hiker comes in, a dead-ringer for Elliott on Just Shoot Me, with the news that a couple of other hikers are behind him. They arrive shortly, preparing to tent out until we suggest that there's plenty of room in the shelter, a park requirement as well (Elliot says the rangers told him the bears have migrated below 3000' this time of year). I build a fire around which everyone starts cooking and warming themselves, with Coleen and I trying the Campmor beef stroganoff dinner. When it's done, I find it absolutely inedible, though I've plenty between the raman and our snack supplies. We all settle in before the fire afterwards, talking for hours with no one too interested in getting to bed. The two guys we'd passed on the trail come through to regroup with their gear a bit before heading out to Newfound Gap. As the old farts here, we lead the charge to turn in at 9:10, the others following within a few minutes. And all that we can be, not what we are." We're awakened at 2:17 by a conversation amongst the guys as they get up for a lav break, getting back to bed and waking at 6:19, the 1st ones up. We quietly assemble breakfast, finding a pea-soup fog outside, but it quickly gives way to a few clouds whistling over the higher ground, and soon clears entirely. 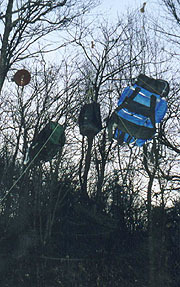 It's quite cold out with a stiff NW wind, and we take to the trail with jackets and glove-liners on. 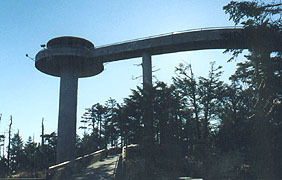 We're driving uphill towards Clingman's Dome - at 6643', the highest point of the entire AT; and soon we spy the "UFO-shaped" observation deck atop. The blustery wind is frigid here, but we take the time to climb the spiral walkway to its top, finding pictures difficult, as the wind blows off hats and everything else not tied down. We retreat to ground level as a couple of girls come up from the parking lot; and after a quick look around decide against the 1/2 mile trip to the parking lot area, having had our fill of the wind and cold up here. We try to savor the fact that we'll never have to climb above this elevation again, but somehow it seems this will be thin consolation some summer day when we're sweating our way up the Presidential's in NH. 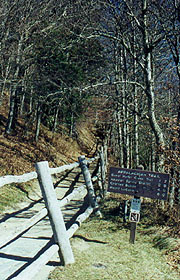 Clingman's Dome Observation Platform, aka "The UFO launch"
The trail is tantalizingly close to the access road, which would be far easier were we not concerned about our "purity" (the trail rocky and steep enough to slow our pace). The trail is a continual series of ups and downs; and as the wind diminishes, we're soon warmed back up - even sweating a bit. We pass a foursome on a blanket, reading and just enjoying nature together, and the increasing automotive noise heralds the approach of civilization (if the 10 million annual tourists here can be described thusly). Indian Gap signals the hour-to-go benchmark, with a quick hop over the ridge separating us from the car. Suddenly we're at Newfound Gap, today crowded with Sunday traffic and a tow truck taking away some illegally parked vehicle (luckily not ours). This time we find a bypass around the Sunday crowds at Gatlinburg, but before setting course for home, it's burger time!